Objective: Dichlorvos (DDVP) is an organophosphate insecticide used against a broad spectrum of insects and also used antihelminthic agent. It is highly toxic to mammals by inhalation, dermal absorption and ingestion. Although its neurotoxic action mediated by acetylcholine esterase inhibition is well known, the role of oxidative stress is not known. We have investigated the oxidative changes in both brain and liver on exposure to a single oral dose of DDVP in the Wistar rats. Materials and Methods: Neuro and hepatotoxic effects of DDVP was investigated in the male Wistar rats. Oxidative stress markers (reactive oxygen species, lipid peroxidation, protein carbonyls and glutathione), and antioxidant enzymes, superoxide dismutase, catalase, glutathione peroxidase, glutathione-S-transferase and glutathione reductatse were measured in rats treated with single dose of DDVP (47mg/kg bw). Results: Inhibition of reactive oxygen species (ROS), lipid peroxidation (LPO) protein carbonyls (PC) and drastic depletion of glutathione (GSH) was seen in all the brain regions and the liver of DDVP treated rats. A severe reduction in the activity of superoxide dismutase (SOD) was seen in both brain regions and liver. Activities of glutathione peroxidase (GPx), glutathione reductase (GR) and catalase were also markedly decreased in the both brain regions and liver. Conclusion: DDVP showed neuro and hepatotoxicity as evident from biochemical markers. Our results clearly show that DDVP causes oxidative perturbances in the brain regions more than in the liver, which should be considered in understanding its toxic consequences. Organophosphate pesticides are widely used in agriculture and industry. Neurotoxicity of organophosphates (OPs) has been attributed to their ability to inhibit acetylcholine esterase (AChE) in the central and peripheral nervous system (Holmstedt, 1959; Eto, 1975). Depending on exposure and route, OPs induce systematic effects of cholinergic symptoms such as pallor, nausea, vomiting, diarrhea, abdominal cramps, headache, dizziness, eye pain, blurred vision, constriction or dilation of the eye pupils, tears, salivation, sweating, and confusion. Severe poising will affect the central nervous system, producing in coordination, loss of reflexes, weakness, fatigue, involuntary muscle contractions, twitching, tremors of the tongue or eyelids, and eventually paralysis of the body extremities and the respiratory muscles. In severe cases, there may also be involuntary defecation or urination, psychosis, irregular heartbeats, unconsciousness, convolutions and coma. Death may be caused by respiratory failure or cardiac arrest. Earlier studies have shown the potential of number of pesticides to generate reactive oxygen species, DNA damage and cytotoxicity in vitro and in vivo systems (Bagchi et al., 1995; Srivastava and Shivanadappa, 2006). Dichlorvos or DDVP (2, 2-dichlorovinyl dimethyl phosphate), is an organophosphate insecticide used against a broad spectrum of insects and also an antihelminthic agent. DDVP is rapidly absorbed and degraded in all mammalian species (FAO/WHO, 1993). It is highly toxic by inhalation, dermal absorption and ingestion. Since DDVP is volatile, inhalation is the most common route of exposure. Acute illness from DDVP is limited to the effects of cholinesterase inhibition (Howard, 1991). Although it was originally thought that all OPs act through irreversible inhibition of AchE, it is now known that their adverse effects on brain actually involve multiple mechanisms, many of which are independent of cholinesterase inhibition. Accordingly, the relative potency of OPs towards cholinesterase inhibition and/or systematic toxicity does not necessarily correlate with their propensity to elicit neurotoxicity. Unlike the cholinergic effects of DDVP, its effects on antioxidant defenses of the liver and brain are clearly established. Neurotoxic compounds have been shown to induce oxidative stress by excessive production of ROS and antioxidant defenses of the brain compromised (Latini et al., 2003; Srivastava and Shivanandappa, 2005). Further, in view of the higher sensitivity of the brain to oxidative stress and lower endogenous antioxidant defenses, the neurotoxic consequence of environmental toxins assumes importance. In this study, we have investigated the oxidative changes in both liver and brain on exposure to a single oral dose of DDVP. Technical grade 97% pure Dichlorvos (DDVP or 2, 2-dichlorovinyl dimethyl phosphate) was purchased from Hydrabad Chemicals pvt ltd. India. Nicotinamide adenine dinucleotide phosphate reduced (NADPH), nicotinamide adenine dinucleotide reduced (NADH), 2ʹ,7ʹ dichlorodihydrofluorescein diacetate (DCFH-DA),1-chloro-2,4-dinitrobenzene (CDNB), thiobarbituric acid (TBA), glutathione (GSH), reduced glutathione (GSSG), 2,4-dinitrophenylhydrazine (DNPH), and pyrogallol were purchased from Sigma Chemical Co. (St. Louis, MO, USA). Trichloroacetic acid (TCA), 5,5’dithiobis (2-nitrobenzoic acid) (DTNB), nitroblue tetrazolium (NBT), triton-X, tris base and other reagents were purchased from Sisco Research Laboratories, Mumbai, India. Ninety days old adult male Wister rats (200-230g) were divided into two groups of six animals each. To the control group, only the vehicle (sunflower oil) was administered. A single dose of DDVP (47 mg/kg bw, dissolved in sunflower oil, the dose was 1/3 of LD50 of DDVP based on MSDS of supplier) was administered by orally using gavage. Animals were sacrificed by ether anesthesia after 24h of administration. Liver and brains were taken out and different regions of the brain, viz, cerebral cortex, midbrain, and cerebellum, and were dissected out on ice immediately for biochemical assays. The institute animal ethical guidelines were followed for the animal experiments. Reactive oxygen species (ROS) generated in tissue was measured using the diacetate ester form of DCFH, dichlorodihydrofluorescein diacetate (DCF-DA) according to the method described previously (Label et al., 1992). The reaction mixture contained tissue homogenate in 0.1M phosphate buffer (pH 7.2) for 15 min to convert DCFH to DCF. Initial fluorescence was measured with the following parameter; excitation λ 488 nm, emission λ 525 nm. The final fluorescence readings were recorded 30 min after the initial fluorescence readings. Glutathione (GSH) content was estimated by the method as previously described (Ellman, 1959) and 10% tissue homogenates were prepared in 5% (w/v) TCA; centrifuged at 2000 rpm for 10 min and supernatant (GSH) was mixed with 10 mM DTNB in 0.1 M phosphate buffer (pH 8.0). The mixture was incubated for 10 min at room temperature and the color was read at 412 nm. Glutathione content was calculated by a standard curve and expressed as µg/mg protein. Lipid peroxidation (LPO) in tissue homogenate was measured by estimating the formation of thiobarbituric acid reactive substances (TBARS) by the method described previously (Ohkawa et al., 1979). Tissue homogenate (10% w/v in 1.15% KCl) was mixed with 1.5 ml 20% TCA and 1.5 ml 1.34% TBA and, boiled for 30 min, cooled, which was followed by the addition of 2.5 ml butanol and centrifuged at 2000 rpm for 5 min. The upper layer was read at 535 nm. TBARS as malondialdehyde (MDA) content of the sample was calculated using the molar extinction coefficient 1.43 x 10-3 M-1cm-1 and expressed as nmoles of MDA/mg protein. Protein carbonyl (PC) content was measured by the method described previously (Levin et al., 1990). 10% w/v tissue homogenates were prepared in 20 mM Tris HCl buffer (pH 7.4), centrifuged at 3000 rpm for 20 min at 40C and 1 ml of the supernatant was precipitated with an equal volume of 20% TCA and centrifuged. The pellet was suspended in 10 mM DNPH and allowed to stand at room temperature for 60 min with occasional vertexing. This was followed by adding 0.5 ml 20% TCA to the mixture and centrifuged, the pellet obtained was washed thrice with ethanol: ethyl acetate (1:1) and solubilized in 2% SDS (in 20 mM Tris HCl, 0.1 M NaCl, pH 7.4). The absorbance was read at 360 nm in UV-Visible spectrophotometer and the carbonyl content was calculated using a molar extinction coefficient of 22,000 M-1 CM-1 and expressed as µg/mg protein. Tissues were homogenized (10% w/v) in ice cold tris buffer (50 mM, pH 7.4) and centrifuged at 3,000 rpm for 20 min at 4°C. The supernatant was used for biochemical assays. Catalase (CAT) activity was assayed by the method as described before (Aebi, 1983). The reaction mixture contained 3% H2O2 in 0.05 M phosphate buffer (pH 7.0). The reaction was started by the addition of 100μl of enzyme and the change in absorbance was read at 240 nm for 3 min and activity was expressed as n mole H2O2/min/mg protein. Superoxide dismutase (SOD) activity was measured using pyrogallol (2 mM) autooxidation as described by previously (Marklund and Marklund, 1974). The reaction mixture contained pyrogallol in 0.1 M tris buffer (pH 8.2) and the enzyme. The reaction was started by adding the substrate and the absorbance was read at 420 nm for 3 min at an interval of 1 min. Glutathione peroxidase (GPx) activity was assayed by the modified method as previously described (Rotruck et al., 1973). The reaction mixture contained 10 mM sodium azide; 4 mM reduced GSH, 2.5 mM H2O2 with 0.1 ml of the enzyme in 0.05 M sodium phosphate buffer (pH 7.4) made up to 2 ml. The reaction mixture was incubated for 3 min at 37oC followed by the addition of 4 ml of 0.3 M disodium hydrogen phosphate and 1 ml of 10 mM DTNB reagent and the color developed was read at 412 nm. Enzyme activity was calculated by the amount of GSH utilized during the reaction and expressed as u/mg protein. Glutathione-S-transferase (GST) activity was assayed by the method described previously (Warholm et al., 1985) with CDNB as the substrate. The reaction mixture contained 20 mM GSH and the enzyme (supernatant) in 0.1 M phosphate buffer (pH 7.4). The reaction was started by adding 30 mM CDNB and change in the absorbance at 344 nm was monitored in spectrophotometer. The enzyme activity was expressed as n mole CDNB conjugate/mg protein. Glutathione reductase (GR) activity was measured by the method as earlier described (Carlberg and Mannervik, 1985). The reaction mixture contained 200 mM phosphate buffer (pH 7.4), 20 mM GSSG and 2 mM NADPH. The reaction was started by adding the enzyme and the absorbance change was measured at 340 nm for 3 min. Protein estimation was determined by the method of described earlier (Lowry et al., 1951) using bovine serum albumin as the standard. The data were expressed as means ± standard error (S.E) of four observations (n=6) and significance was evaluated by Independent sample “T” test using SPSS version 14 (*p<0.05, **p<0.01, ***p<0.005). Cholinergic symptoms of toxicity were observed in the DDVP administered rats, which induced lacrimation, salivation and urination within 24h. 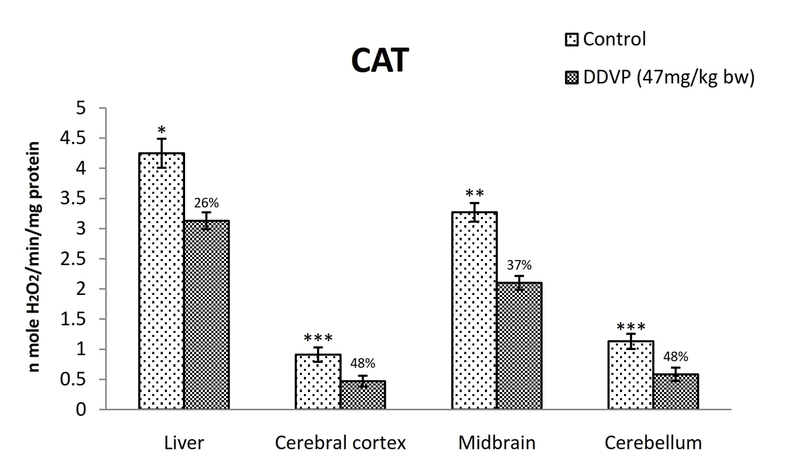 Biochemical assays showed marked increase in reactive oxygen species was seen in all the brain regions and liver of DDVP treated rats, with highest being in cerebral cortex (433%) followed by liver (379%), midbrain (194%) and cerebellum (173%) as shown in figure 1. 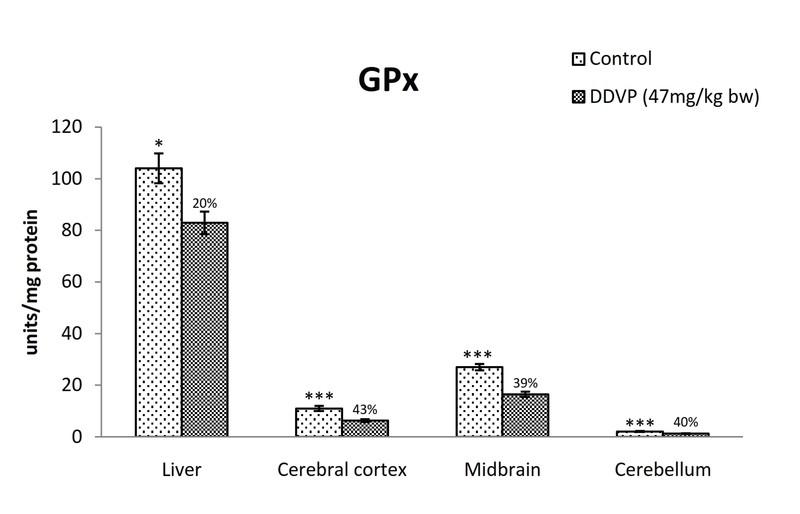 Reduction of GSH content was seen in the brain regions of DDVP treated rats being maximum in cerebral cortex (51%) followed by midbrain (27 %), cerebellum (30%) and liver (23%) (Figure 2). 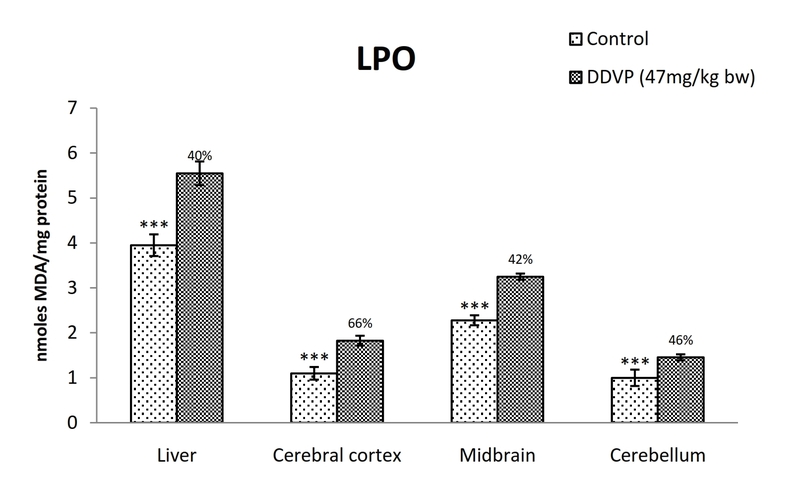 A significant increase in lipid peroxidation was seen in all the brain regions of DDVP treated rats, being highest in the cerebral cortex (66%) followed by midbrain (42%), cerebellum (46%) and liver (40%) as shown in figure. 3. 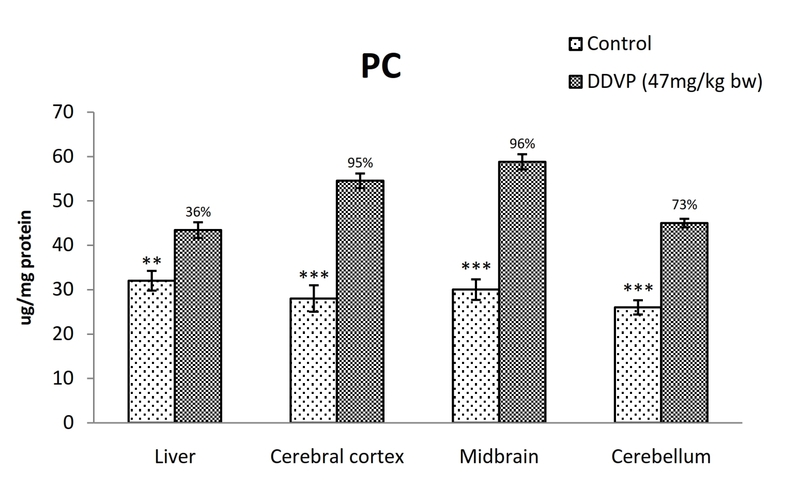 In figure 4, distinct increase in protein carbonyl content was observed in the brain regions of DDVP treated rats, being highest in cerebral cortex (105%) followed by midbrain (53%) , cerebellum (43%) and (36%). Figure 1. Dichlorvos-induced oxidative stress in the liver and brain. ROS: reactive oxygen species. Data indicates the mean ± S.E (n = 6). The numbers above the bars represents the percentage difference between control and treated groups. Figure 2. Dichlorvos-induced oxidative stress in the liver and brain. GSH: glutathione. Data indicates the mean ± S.E (n = 6). The numbers above the bars represents the percentage difference between control and treated groups. Figure 3. Dichlorvos-induced oxidative stress in the liver and brain. LPO: lipid peroxidation. Data indicates the mean ± S.E (n = 6). The numbers above the bars represents the percentage difference between control and treated groups. Figure 4. Dichlorvos-induced oxidative stress in the liver and brain. PC: protein carbonls. Data indicates the mean ± S.E (n = 6). The numbers above the bars represents the percentage difference between control and treated groups. Effect of DDVP showed distinct regional variation in the brain. 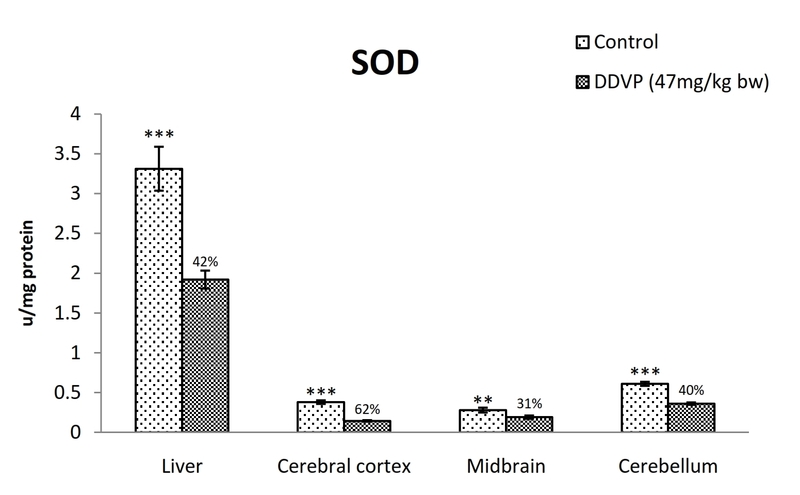 A marked decrease in superoxide dismutase activity was seen in the cerebral cortex (62%) of DDVP treated rats followed by cerebellum (40%) and midbrain (31%) (Figure 5). Glutathione peroxidase and glutathione reductase activity were reduced by 40% in all the brain regions of DDVP treated rats, with no significant differences between the brain regions (Figure 7 and 9). Catalase activity was also decreased in the brain of DDVP treated rats. Cerebral cortex and cerebellum showed highest reduction (49%), followed by midbrain (37%) (Figure 6). Glutathione-S-transferase activity was also reduced significantly in the cerebral cortex (49%), followed by cerebellum (37%) and midbrain (27%) (Figure 8). Figure 5. Effect of Dichlorvos on activity of superoxide dismutase (SOD) in the liver and brain. Data indicates the mean ± S.E (n = 6). The numbers above the bars represents the percentage difference between control and treated groups. Figure 6. Effect of Dichlorvos on activity of catalase (CAT) in the liver and brain. Data indicates the mean ± S.E (n = 6). The numbers above the bars represents the percentage difference between control and treated groups. Figure 7. Effect of Dichlorvos on activity of glutathione peroxidase (GPx) in the liver and brain. Data indicates the mean ± S.E (n = 6). The numbers above the bars represents the percentage difference between control and treated groups. Figure 8. Effect of Dichlorvos on activity of glutathione-S-transferase (GST) in the liver and brain. Data indicates the mean ± S.E (n = 6). The numbers above the bars represents the percentage difference between control and treated groups. Figure 9. Effect of Dichlorvos on activity of glutathione reductase (GR) in the liver and brain. Data indicates the mean ± S.E (n = 6). The numbers above the bars represents the percentage difference between control and treated groups. DDVP being fat soluble, is easily absorbed through the skin and transported to different tissues, and believed to cause toxicity by inhibition of acetylcholine esterase (AChE). However, AChE inhibition alone does not explain the toxic outcome of DDVP. For example, the renal dysfunction secondary to OPs exposure in humans was found not correlated with the degree of cholinesterase suppression (Poovala et al., 1998). Studies on DDVP toxicity have shown that OPs produce oxidative stress in different tissues through induction of ROS (Banerjee et al., 1998; Ahmed et al., 2000; Akhgari et al., 2003). Our study, a single oral dose of DDVP produced a significant induction of ROS in both liver and brain, indicating oxidative stress. ROS such as superoxide anion, hydrogen peroxide, and hydroxyl radical are produced in a number of cellular reactions and by the enzymes such as lipooxygenases, peroxidases, and dehydrogenases. ROS are part of normal oxidative metabolism. However, when produced in excess, ROS cause cellular damage by membrane lipid peroxidation, DNA damage and enzyme inactivation (Halliwell and Gutteridge, 1999). The antioxidant enzymes such as superoxide dismutase, catalase, and glutathione peroxidase act as natural enzymatic defenses and act in concert with non enzymatic antioxidants. Xenobiotic exposure and different levels of environment contaminations also induce oxidative stress (Halliwell and Gutteridge, 1999). Excessive oxidative stress leads to peroxidation of membrane lipids and cellular injury and impaired antioxidant defenses lead to oxidative damage to cellular macromolecules (Banerjee et al., 1998; Halliwell and Gutteridge, 1999). An increase in oxidative stress may be due to the decrease in the antioxidant defense or due to the increase in the progress, which produces oxidants (Zang et al., 2000). Our results show that, DDVP administration to rats reduced the endogenous antioxidant defenses of both liver and brain as evident from the decreased activity of the antioxidant enzymes. Reduction in activity of antioxidant enzymes causes the induction of oxidative stress in the brain, leading to neuronal damage. Our results show increased protein carbonyl content in tissues which indicates oxidative modifications of proteins, with functional consequences such as loss of enzyme activity (Pigeolet et al., 1990). Oxidative modifications to mitochondrial proteins resulting in loss of the enzymatic activity have been reported in ischemia-induced brain damage and Alzheimer’s disease (Shacter, 2000). This could be responsible for the lowered activity of antioxidant enzymes in brain of DDVP administered rats. Glutathione a cytosolic tripeptide, is the major non-enzymatic regulator of intracellular redox homeostasis. GSH also serves as substrates for glutathione peroxidase and GST, primarily involved in the detoxicification of toxic electrophilic metabolites via the formation of GSH-conjugates. 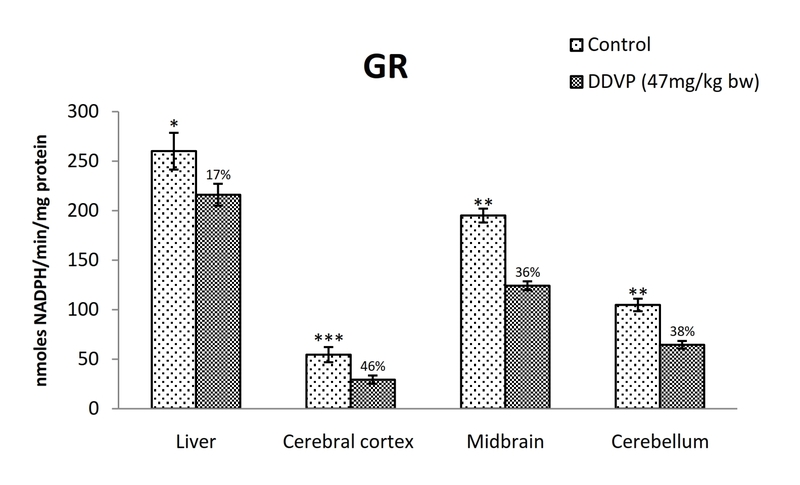 Our results demonstrate that DDVP administration to rats led to marked depletion of glutathione level in the brain regions and liver, which predisposes the brain and liver to oxidative stress (Barros et al., 1988). During the enzymatic reaction catalyzed by GPx, GSH is oxidized to GSSG, which is reduced back to GSH by GR. GR, therefore, plays a central role in maintaining the cellular GSH level. 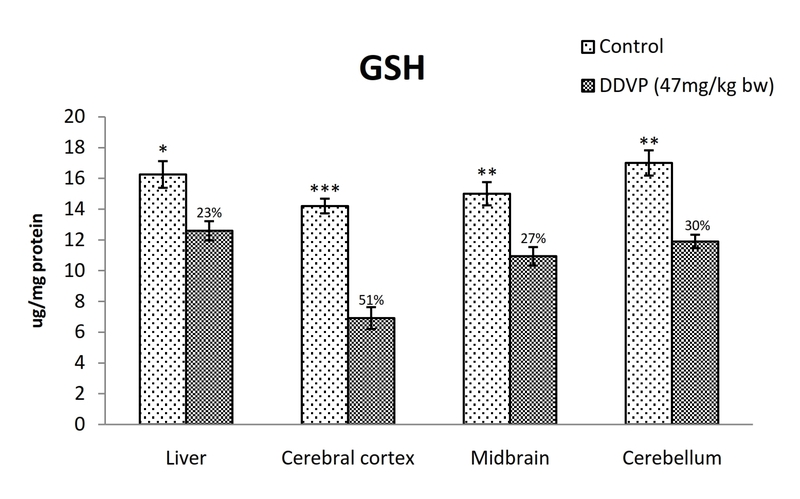 Reduction in GR activity by DDVP (Figure 9), affects the regeneration of GSH, thus accentuating the effects of GSH depletion (Martinez-Cayuela, 1995). GST plays an important role in protecting cells against ROS mediated injury by detoxicification of lipid hydroperoxides formed due to oxidative damage. 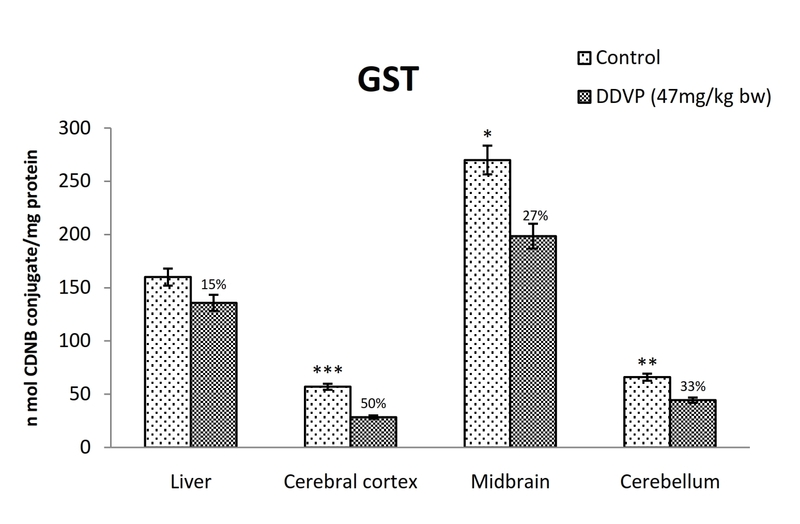 Our results show reduced activity of GST in the brain and liver by DDVP, which compromises the biochemical antioxidant defenses, leading to oxidative stress in cells. 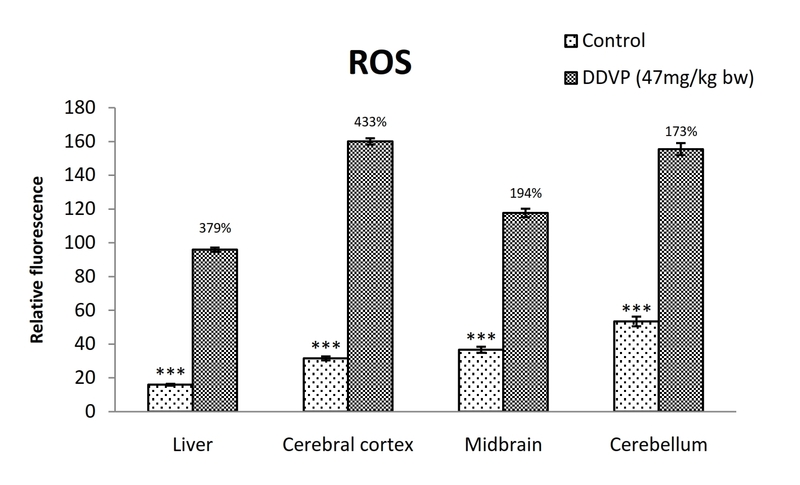 Our study shows that brain shows higher oxidative stress to DDVP than liver. Our results are consistent with earlier observations on the regional differences in the antioxidant enzymes in the brain regions and add to the evidence that the vulnerability to oxidative stress of the brain in region specific (Srivastava and Shivanandappa, 2005; Back et al., 1999; Ritesh et al., 2015). Regional variations in brain regions to DDVP imply its differential distribution in the brain regions and/or its metabolism. Induction of oxidative stress in the brain regions of rat by DDVP, as evident by the alteration of antioxidant balance in both enzymatic and non-enzymatic antioxidants status is reported for first time. Although the cholinergic symptoms of DDVP are well known, our result demonstrates that it causes oxidative perturbances in the brain regions, which could add to its specific toxic consequences, in addition to cholinergic effects. The authors wish to thank Council of Scientific and Industrial Research (CSIR), New Delhi, for the financial support. Aebi H. 1984. Catalase in vitro. In Methods in enzymology, Vol. 105, Oxygen radicals in biological systems, Ed. L. Packer, 121–126. Orlando, FL: Academic Press. Ahmed RS, Seth V, Pasha ST, Banerjee BD. 2000. Influence of dietary ginger (Zingiber officinales Rosc) on oxidative stress induced by malathion in rats. Food and Chemical Toxicology 38(5): 443–450. Akhgari M, Abdollahi M, Kebryaeezadeh A, Hosseini R, Sabzevari O. 2003. Biochemical evidence for free radical-induced lipid peroxidation as a mechanism for subchronic toxicity of malathion in blood and liver of rats. Human and Experimental Toxicology 22(4): 205–211. Baek BS, Kwon HJ, Lee KH, Yoo MA, Kim KW, Ikeno Y, Yu BP, Chung XY. 1999. Regional difference of ROS generation, lipid peroxidation, and antioxidant enzyme activity in rat brain and their dietary modulation. Archives of Pharmacological Research 22: 361–366. Bagchi D, Bagchi M, Hassoun EA, Stohs SJ. 1995. In vitro and in vivo generation of reactive oxygen species, DNA damage and lactate dehydrogenase leakage by selected pesticides. Toxicology 104(1-3): 129–140. Banerjee BD, Pasha ST, Hussain QZ, Koner BC, Ray A. 1998. A comparative evaluation of immunotoxicity of malathion after subchronic exposure in experimental animals. Indian Journal of Experimental Biology 36(3): 273–282. Barros SB, Videla LA, Simizu K, Van HL, Junqueira VB. 1988. Lindane-induced oxidative stress. II. Time course of changes in hepatic glutathione status. Xenobiotica 18(11):1305–1310. Carlberg I, Mannervik B. 1985. Glutathione reductase. Methods of Enzymology 113: 484-490. Ellman GL. 1959. Tissue sulfhydryl groups. Archives of Biochemistry and Biophysics 82(1): 70–77. Eto M. 1975. Organophosphorus pesticides: organic and biological chemistry. CRC Press. FAO/WHO, Pesticides Residues in Food. 1993. In. Joint FAO/WHO Meeting on pesticide residuces, Geneva, 20-29 September, 83-124. Holmstedt B. 1959. Pharmacology of organophosphorus cholinesterase inhibitors. Pharmacological Reviews 11(3): 567–688. Latini A, Scussiato K, Rosa RB, Llesuy S, Belló-Klein A, Dutra-Filho CS, Wajner M. 2003. D-2-hydroxyglutaric acid induces oxidative stress in cerebral cortex of young rats. Europeon Journal of Neuroscience 17(10): 2017–2022. Lebel CP. 1992. Ischiropoulos H, Bondy SC. Evaluation of the probe 2ʹ, 7ʹ- dichlorofluorescin as an indicator of reactive oxygen species formation and oxidative stress. Chemical Research in Toxicology 5(2): 227-231. Levine RL, Garland D, Oliver CN, Amici A, Climent I, Lenz AG, Ahn BW, Shaltiel S, Stadtman ER. 1990. Determination of carbonyl content in oxidatively modified proteins. Methods in Enzymology 186: 464–478. Lowry OH, Rosebrough NJ, Farr AL, Randall RJ. 1951. Protein measurement with the Folin phenol reagent. Journal of Biological Chemistry 193(1): 265–275. Marklund S, Marklund G. 1974. Involvement of the superoxide anion radical in the autoxidation of pyrogallol and a convenient assay for superoxide dismutase. European Journal of Biochemistry 47(3): 469–474. Martínez-Cayuela, M. 1995. Oxygen free radicals and human disease. Biochimie 77(3): 147-161. Ohkawa H, Ohishi N, Yagi K. 1979. Assay for lipid peroxides in animal tissues by thiobarbituric acid reaction. Analytical Biochemistry 95(3): 351–358. Pigeolet E, Corbisier P, Houbion A, Lambert D, Michiels C, Raes M, Zachary MD, Remacle J. 1990. Glutathione peroxidase, superoxide dismutase, and catalase inactivation by peroxides and oxygen derived free radicals. Mechanisms of Ageing and Development 51(3): 283–297. Poovala VS, Kanji VK, Tachikawa H, Salahudeen AK. 1998. Role of oxidant stress and antioxidant protection in acephate-induced renal tubular cytotoxicity. Article in Toxicological Sciences 46(2): 403–409. Ritesh KR, Suganya A, Dileepkumar HV, Rajashekar Y, Shivanandappa T. 2015. A single acute hepatotoxic dose of CCl4 causes oxidative stress in the rat brain. Toxicology Reports 2: 891–895. Rotruck JT, Pope AL, Ganther HE, Swanson AB, Hafeman DG, Hoekstra WG. 1973. Selenium: biochemical role as a component of glutathione peroxidase. Science 179(4073): 588–590. Shacter E. 2000. Quantification and significance of protein oxidation in biological samples. Drug Metabolism Reviews 32(3-4): 307–26. Srivastava A, Shivanandappa T. 2005. Hexachlorocyclohexane differentially alters the antioxidant status of the brain regions in rat. Toxicology 214(1-2): 123–130. Srivastava A, Shivanandappa T. 2006. Causal relationship between hexachlorocyclohexane cytotoxicity, oxidative stress and Na+, K +-ATPase in Ehrlich Ascites tumor cells. Molecular and Cellular Biochemistry 286(1-2): 87–93. Warholm M, Guthenberg C, Bahr CV, Mannervik B. 1985. Glutathione transferases from human liver. Methods in Enzymology 113: 499-504. Zang Z, Apse K, Pang J, Stanton RC. 2000. High glucose inhibits glucose-6-phosphate dehydrogenase via cAMP in aortic endothelial cells. Journal of Biological Chemistry 275(51): 40042–40047.